Lucky Dog Stamper: Thank You! A quick post to show off one of the cards I made while my computer was sick. I love Cosmo Cricket patterned papers and Odds and Ends is no exception! I really like the sentiments in Papertrey's Iconic Images stamp set. They are a nice size and a nice mix of fonts. Love this card! The papers are gorgeous. 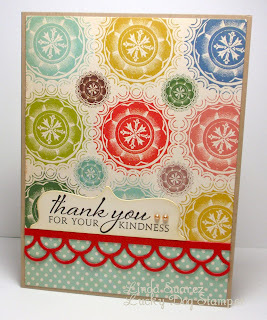 Love the punched border, too! Wonderful card Linda!! The paper is awesome! !